The first photo from the set of the still-untitled Han Solo film was posted Tuesday, and things are pretty cramped in the Millennium Falcon. 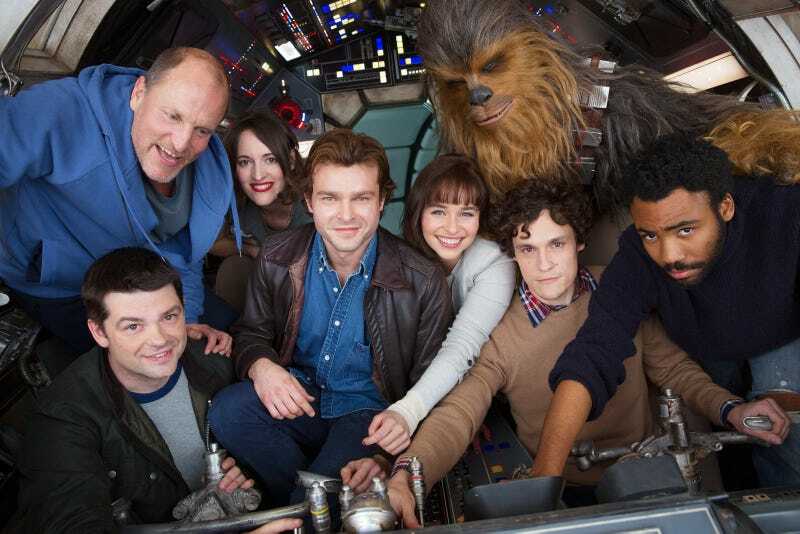 From left to right you’ve got Woody Harrelson, co-director Chris Miller, Phoebe Waller-Bridge, Alden Ehrenreich, Emilia Clarke, co-director Phil Lord, Donald Glover, and, of course, Chewbacca. Along with the photo comes a few minor pieces of news. There’s confirmation that Waller-Bridge and Thandie Newton are in the film. Joonas Suotamo is playing Chewbacca and, though there were a few rumors to the contrary, the film is back on its May 25, 2018 release date. Cameras are now rolling. Expect to learn some more in April at Star Wars Celebration.